It’s been a little while since I added an activity to the blog. But an angry volcano is a long time art activity favorite which I am very excited to share. 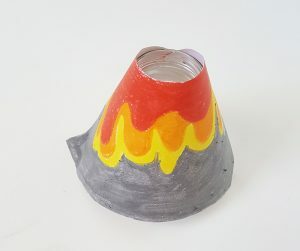 An angry volcano can be crafted many different ways and can be adapted to make a big multi-stage art project or you can whip up the basic materials for a bit of instant fun. I have used this activity countless times in my Art Therapy practice, because it’s interactive and a great conversation starter about anger. Really the sky is the limit with this art activity but here is the basic method and some variations to get you bubbling (!). Younger children may need some extra help, but it’s suitable for any age. Firstly cut a half circle curve from the longest part of your A4 paper. Wrap around your jar just to check it will roughly fit, it’s normal for there to be some overlap. Spend some time decorating the volcano with dirt, grass and lava colours using crayons, paint or other materials. Bold colours works best. Most children will happily complete this step without help. Depending on the size of the jar you want to add enough water to fill 2/3 jar. Then add a good few heaped table spoons of bicarb-soda and a few drops of desired food colouring or paint (optional), Mix materials together. Some recipes call for a few drops of dishwashing liquid. Mine worked fine without, but add or experiment with this extra. When ready pour vinegar into the top of the volcano/jar until it begins bubbling. Usually you can add vinegar an extra time or two to get multiple eruptions. Enjoy watching it bubble and overflow, then repeat! With variations it’s all about the volcano style. If you have lots of time with your children for a multi-stage art project then try making the angry volcano out of paper-mache or dough. It’s easier to model these materials around a container, jar or plastic bottle to ensure there is plenty of room for lava inside. Once dry the volcano’s can be decorated with any range of art materials, from paint to cellophane. If even making a wrap around volcano, like ours, just seems all too much then try this super easy variation using pebbles or gravel in your own garden. Setting a scene for your volcano can also lengthen this science experiment creating time for imaginative play. Set up the angry volcano in a tray or in the garden and allow your child some time to create an extended landscape with trees, rocks and even figurines. Just remember surrounding objects may end up wet. Sandpits also make great locations. The diverse process of this art activity means that it requires a range of skills and offers the opportunity for a range of lessons. 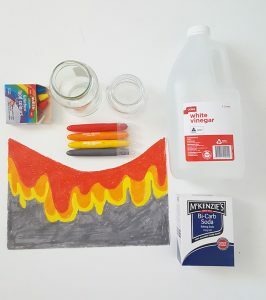 Creating the volcano whether that’s via laminated paper wrap-around, paper-mache or dough will support the use of your child’s fine motor skills. It’s a methodical process so children practice sequences, instruction following and problem solving. Choosing colours and surrounding landscapes encourages decision making and use of imagination. 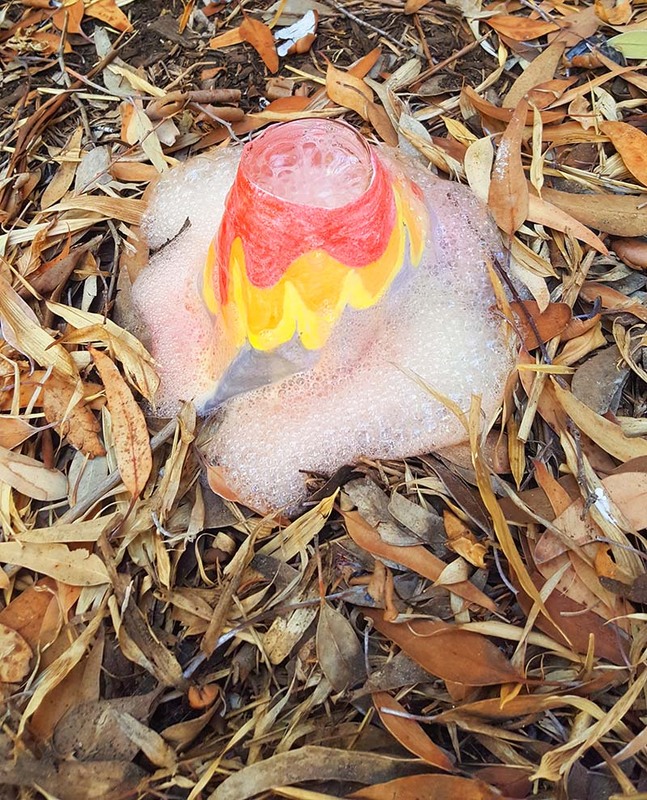 Most obviously the lava creation can be a terrific science experiment, not only looking at chemical reactions in the activity but also researching and exploring the natural wonder of volcano’s. If you home school your children or you’re a school teacher, this activity can be a great building blog for a host of follow on activities in science and geography. Compare the method of adding ingredients to adding emotion without “letting it out”. It build up and builds up and then erupts! Note how little control there is when it erupts; how is the surrounding landscape effected? Explore ways they can keep their angry volcano from erupting and healthy ways to manage anger. I usually tell kids the best way is to let it out bit, by bit. Things they can do is, tell someone, draw it, go for a run, jump-up and down, scream into a pillow. Relaxation activities are great, but you want the anger to be expressed rather than repressed. There is no shame in feeling angry. Use the opportunity to read books, make other emotion based art activities or simply chat about whatever your child wants to. It’s natural as a parent to want to fix things, but listening, being curious and helping your child recognize and make sense of emotions like anger is invaluable. If you have any more question’s ask them below.